A little preview of the cruise photos coming up soon. I took this on a private island owned by the cruise line in the Bahamas. They had all these colorful cabanas that you could rent for the day. The weather was perfect. 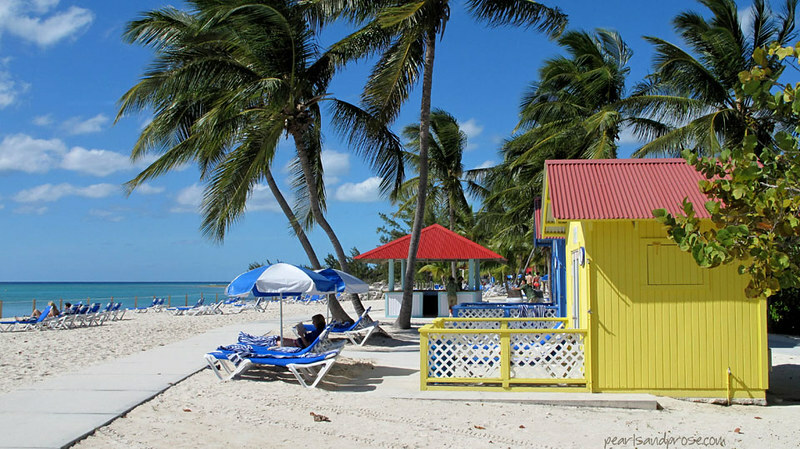 This entry was posted in photography and tagged beach umbrellas, Caribbean, palms, yellow beach cabana. Bookmark the permalink. I’m so excited to hear about your trip and this is a wonderful photo! I would love to be there right now. It was so beautiful over there, TBM. You would love all the sunshine! Woke up to fog and chilly temperatures today. Sunshine does sound nice. I haven’t been in the Caribbean for quite some time. Your photo puts me in the mood. I hadn’t been for a long, long time, Caroline. Forgot just how beautiful the turquoise water can be. Thank you. 🙂 It was fun to be on a French-speaking island. Oh my. When you said the weather was perfect, you weren’t kidding. That is a picture postcard! Looking forward to more photos from your cruise. so beautiful, can’t imagine being there. Please more, more pictures!! Thank you. 🙂 Coming up soon!